Ever since the early 1990s, Raekwon has been a name synonymous with rap music around the world. 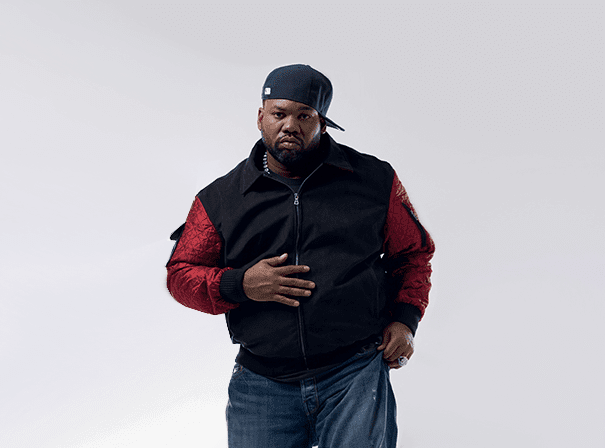 Born Corey Woods, Raekwon was part of what is undeniably one of the most accomplished and celebrated hop hip groups of all time: the Wu Tang Clan. His ability to lay down killer raps and rhymes was at the centre of eveything the band did, and so his voice is forever tied with hits like ‘Protect Ya Neck’. It was in 1995 that Raekwon went solo and put out the seminal debut album Only Built 4 Cuban Linx that picked up praise from press and punters alike. A real sonic journey with classic narratives and essential hooks, it has supreme production from The RZA (a band mate in Wu Tang Clan) and it also showcased fellow bandmate Ghostface Killah, thus marking the start of Rae and Ghost, a collaborative project that has spawned many hits. Over the years Raekwon has followed up his early success with albums like Immobiliarity in 1999 and The Lex Diamond Story in 2003, as well as the sequel to his debut, Only Built 4 Cuban Linx II. It had great success from early on and topped many global charts, coming as it did on his own label, Ice H2O. Nowadays just as adept as singing fresh new talents as he is playing live or laying down great rhymes, American star Raekwon remains one of the most important rappers of our time.